Slate roofs have been around for generations. This natural roofing material is made from mined, fine-grain sedimentary rock. To make roofing tiles, the slate is broken into tiles or shingles with the edges either left rough or polished to a smooth edge. A slate roof gives a building a distinctive, elegant appearance. Slate roofing is a popular choice in the Washington, DC area, especially in the historic districts of many of the most desirable neighborhoods of Washington, DC, Maryland, and Northern Virginia—and for good reason. Slate roofing provides decades of virtually maintenance-free roofing, superior aesthetics, and increased home value! Slate roofing requires different techniques and skills from those needed on asphalt and other types of roofing. Slate shingles are attached to the roof by drilling holes in each shingle and nailing them to the roof supports. Since slate shingles don’t expand or contract with the weather like wooden shingles, they are set closely together with each layer slightly overlapping the next. 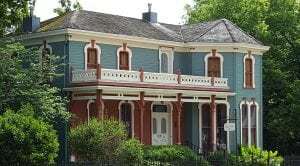 The roofers at Dominion Roofing Co. know that there are unique challenges when installing slate roofing on many roofs, but we have the experience and skills necessary to navigate around any challenge—allowing us to install a beautiful slate roof with the care and precision needed for decades of trouble-free use. Though slate roofs are very durable and generally require little maintenance, even the best slate roof may need a repair from time to time. Debris from a chimney or vent can crack a shingle or a few may be damaged during the installation process. 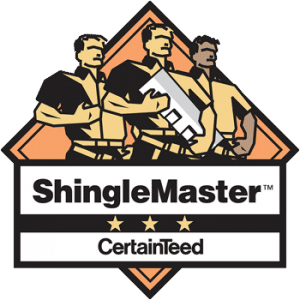 Fortunately, it’s an easy process for a skilled roofing contractor to replace a few individual shingles. With more than 25 years of slate roofing repair experience, the experts at Dominion Roofing Co. have seen and repaired all types of slate roofing problems. From small crack repairs to major damage caused by falling trees, Dominion Roofing Co. can get your roof repaired fast. There are many advantages to installing a slate roof. Chief among these is the beauty this natural material lends to a home. Each tile has a slightly different hue that blends together to give a deep and earthy loveliness to any structure. Slate is particularly well-suited to historic homes. Slate is also among the most durable roofing material available. A well-installed slate roof can last up to 100 years. Slate roofs were very popular in the late 19th century and early 20th century. In fact, some of these 100-year-old roofs are still intact! Slate roofs are non-combustible and resist water, wind and storm damage. Because of this, some homeowner’s insurance companies offer discounts for homes with slate roofs. Such roofs also require little maintenance to keep them looking clean and beautiful for decades. Why Choose Dominion Roofing Co. For Slate Roofing? Installation and repair of a slate roof is not something that you want to leave to a seasonal handyman or someone who doesn’t specialize in roofing projects. The materials are too expensive to waste on an improper installation job. You need an experienced roofing contractor like Dominion Roofing Co.
We’ve been helping DC area home and business owners with their roofing needs for more than 25 years. Call us at (301) 942-2009 click “Get an Estimate” to set up an appointment.